There was a toy that I purchased my girls while they were growing up in the 80’s that fascinated me. I never played with (that is my story and I am sticking to it), but sure was tempted. I really wish it had been around when I was growing up. Yes, I would have likely played with it. The object was to choose plates, that represented, a head, clothing tops, and bottoms as in skirts or pants. 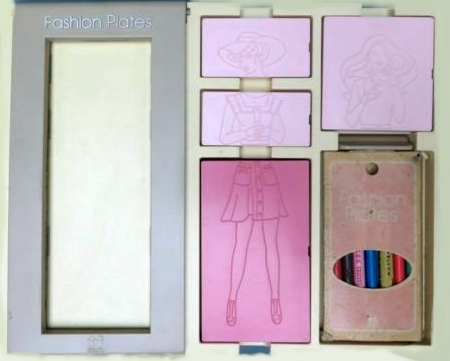 All of the inter-changeable plates had “a flair” to them and the combination allowed for many different styles. After arranging the plates you inserted a sheet of white paper, ran a black crayon on its side over the plates and your design is transferred. You then have a "fashion combination template" to color and study. It is still around in a new version. The girls played a lot with this. Little did they know that I was watching with envy the whole time.